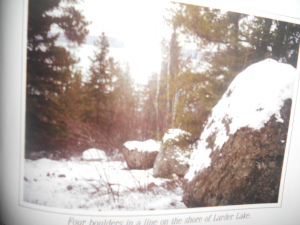 Editor’s note: One would think that when you have a natural or possibly man-made phenomenon like Stonhenge Ontario, located at Larder Lake in northern Ontario, you would be marketing it to the max. But not Ontario … Not Canada. So here’s the scoop. So-called “Stonehenge Ontario.” This is the only known photograph published online. Mt. Cheminis, a volcanic plug near Larder Lake. sun, and their proximity to Mt. 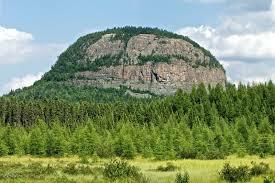 Cheminis, a volcanic plug, suggest that the stones were once a Native American shrine used for worship. Archaeologists who have dug in the area have found evidence that Indians lived in the area 6.000 years ago and there is evidence present that suggests they had established a huge quarry nearby. Archaeologists continue to work in the area to find more clues to the mystery of the stones. That’s it … All that is available online for an unique phenomenon that remains as mysterious as the original. Found a 2nd photograph and posted over at my blog http://mysteryhistory.tv/the-stonehenge-of-north-ontario-canada/ as well I have a couple of maps that point to the exact location as well an overhead map of the layout of the stones. Thanks you for the new information regarding ‘Stonhenge Ontario.’ It is a fascinating subject, but I can’t understand why the feds or province haven’t undertaken a more aggressive study of the area. Mind you, I’m not a great fan of either.